Buy online Boost Selection White Carrera with Thassos Line 11-1/4 in. x 12 in. 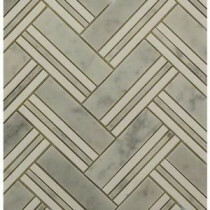 x 10 mm Marble Mosaic Tile BOOST WHITE CARRERA and leave review or share with Your friends. The Boost Selection White Carrera with Thassos Line 11-1/4 in. x 12 in. x 10 mm Marble Mosaic Tile gorgeous neutral stone tile with style to spare. Elegantly composed of rich noce travertine and beige marble, this decadent entry from our Boost collection will add subtle, stylish charm to your home. Mesh backing makes installation a snap, as well as allowing you to separate each one to make your own pattern and experiment them in your bathroom or kitchen and find your own personal tile heaven. 1 square foot per piece, sold as an each. Piece weight equals 4 lbs.